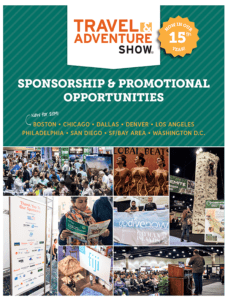 Sponsor the Largest Travel Show Series in the U.S.
Our Shows create dynamic brand awareness for your destination and create consumer confidence in your product. In fact, 53% of TAS attendees stated they were more confident in an exhibitor just because they were at the show. The Travel & Adventure Show provides unparalleled booking results with 89% of attendees who are ready to book their next vacation, booking that trip with an exhibitor they met at the show. Place your destination or product in front of tens of thousands of ready to buy consumers and take advantage of the high impact opportunity designed to strengthen your brand, maximize your exposure, increase your visibility and increase your overall ROI.